Shop online for over 200 model railroad operating accessories at discounts up to 63%. HO Scale is the most popular of the 6 model railroad operating accessories categories, then N Scale, and O/027 Scale. Model Power is ranked #1 out of 44 model railroad operating accessories manufacturers, followed by NJ International, and Bachmann. This Package Contains Two O-027 Scale Handcrafted Brass Double Highway Lamp Posts from Model Power. Recommended for Ages 14 and Older. This is an N Scale 3-Way Traffic Light with Switch from Model Power. 5.5 gram tube Also an excellent general purpose lubricant for use all around the layout to reduce friction in moving parts and bearing surfaces. Add a puff inside your couplers, move them back-and-forth a few times to burnish and enjoy smooth action of your couplers. Model Power Designed These Goose Neck Lamp Posts to be Used with Any HO Scale Model Railroad and Scenic Displays. This is an HO (1:87) Scale Lighted Railroad Signal by Model Power. For Adult Model Railroaders. This is the Railroad Signal Building Plastic Model Kit by Modle Power Suitable for Ages 14 & Older. This is a Set of Three 2" Frosted Round Boulevard Lights from Model Power. 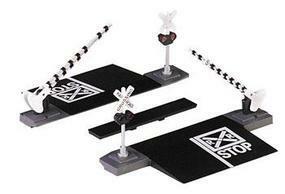 This is the E-Z Track Graduated Pier Set by Bachmann Suitable for Ages 8 & Older. This is the HO Scale 90' Turntable - Kit - Pit Diameter- 13-3/16 33cm Bridge Holds Loco Up To 12-3/8 from Walthers. This Package Contains Three Brass Handcrafted Clear Old Fashioned Lamp Posts for Your O Scale Layout or Diorama from Model Power. Light Up Any O Scale Model Layout with These Three Highway Lamp Posts Realistically Designed by Model Power,. This is an HO Scale Warning Light with Relay from Model Power. These are N Scale Single Highway Lamps from Model Power. This Package Contains Three Brass Handcrafted Clear Suburban (1-1/2") Lamp Posts for Your HO Scale Layout or Diorama from Model Power.